The instructions on the back of the corn seed package say, and I quote, "Plant seeds six inches apart. When seedlings are three inches tall, thin to ten inches apart." I know this wouldn't bother most people, but I'm the sort who sketches my garden on a piece of graph paper and gets out the measuring tape on planting day. As much as I enjoy doing the impossible, I think I'm going to have to either plant seeds five inches apart, or settle for twelve inch spacing between my cornstalks. Finally! I finally got in the zone again. I sat down and wrote 1,000 words in an hour. It was a great morning! But now I have to go vote and get a new pair of glasses for my three-year-old, who finally, after ten weeks, broke his new glasses beyond repair. My insurance only pays for one pair every other year, so now I am free! Free to shop around and go anywhere that sells eyeglasses! Free! Free! I have to pay out of pocket, but I get to pick who gets paid! Long live capitalism! Next month we will begin our fifth year at Nevada State College. That means it is (fanfare please) time for my husband to apply for tenure. This is the final obstacle in the career of a college professor. We've jumped through many hoops already. Undergraduate school, graduate school, qualifying exams, dissertation, post-doctoral work, landing a tenure-track position, and now last of all, we have to convince the college that they want to keep him forever. I don't see why that should be so hard. I want to keep him forever. And I don't even need a several hundred page report detailing all the things my husband has done for me over the past four or five years, submitted to an outside committee for review. Unfortunately, the school does need such a report. It is going to be a long, hard year. I was getting scared at first, but then I realized that God has always prepared us for these hurdles and obstacles. He knows what is coming up in our lives, and has already put the pieces in place. I am grateful to know that God lives and that he can communicate with us through prayer, and I am grateful for all the times he has shown us what to do in the past. I have perfect confidence that he will carry us through this time as well, no matter what the outcome. At our last visit to the ophthalmologist (only one misspelling that time!) - which I can only hope was actually covered by our insurance - I found out that my three-year-old's eyes are not crossing as much as they used to. That's great news! The glasses are working. When the nurse asked me to cover my child's left eye he read everything off the chart, both near and far. But then, when I covered his right eye he shook his head and pulled my hand away. When I finally got him to sit still and look at the eye chart, he couldn't tell a ducky from a birthday cake. The nurse asked him what he saw on the projection screen across the room and he said, "Fire!" I guess because of the light. The ophthalmologist had a student ophthalmologist with her that day. She explained to him (not to me) that my son had (insert unpronounceable term as hard to spell as ophthalmologist) which simply means that his eyes had been crossing to compensate for the difficulty of focusing, and in order to avoid seeing double, his brain learned to ignore the left eye. The solution: an eye patch over the stronger eye, worn two hours a day, while the child does some activity involving vision, like television, computer games, puzzles, or books. My first thought was, "That's not so bad." I am sorry to admit my second thought was, "There goes my writing time." I already told you how much my son hated me covering his right eye with my hand. The patch was even worse. It was a clever little contraption that attached to his glasses instead of sticking on his face. He quickly learned how to pull it down just enough to peek over it so that it looked like he was wearing it even when it wasn't doing him any good. If I tried to read to him or do puzzles, he would hop up and run away, fling his glasses off in some hard-to-find location, and then come back. I decided to work him up to the full two hours instead of asking him to do it all on the first day. It was uncanny doing puzzles with him the first time he wore his patch. Using both eyes, he could always get the pieces in the right place every time. With his left eye, he fumbled around and usually aimed the pieces about half and inch to the left. But now, at the end of the second week, he will wear his patch for about thirty minutes before he tries to dispose of it when I'm not looking, and he will point directly to pictures on command instead of off to the left of them. It seems to be working. I'm supposed to go back to the ophthalmologist in two weeks. If I can get my referral extended. Hopefully she'll confirm my suspicions that my son's left eye is on the way to recovery, and she won't do anything that requires any pre-authorization I haven't got. The monsoon is here! 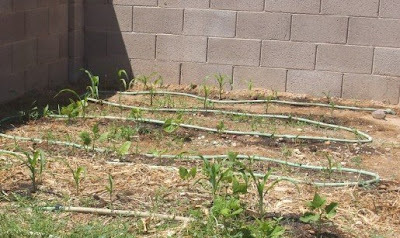 It is time for those of you who live in Southern Nevada to PLANT YOUR CORN! Yes, you may have thought it was too late to put in a garden this year, but the trick with corn is to wait until the humidity goes up and then plant. With the soil as warm as it is, the corn just pops right out of the ground and shoots up - all you have to do is water it. By the time it starts to tassel the weather will be cooling off and the tassels will not shrivel up and die in the sun, like they would have if you planted corn in March or April. In other news, we have mice again. There is a place in the garage where they can jump up into the walls, and a hole in the wall at the bottom of the stairs where they can easily get into the house. I patched the hole in the wall and set out the trap. The very best bait for mouse traps is toasted peanut butter. Spread a little peanut butter on the trigger, then brown it with a match for less than a second. We had a very stubborn mouse that would not touch the trap no matter what we put in it, until I tried the toasted peanut butter. At least he died happy. My husband and I signed up to do a dance number at the church pot-luck social and talent show. This would have been fine, except I have a three-year-old child, and someone brought Nacho Cheese Doritos. First, my three-year-old stands at the buffet table, munching Nacho Cheese Doritos right from the bag. Then he comes over to our table, where I have cut up a hot dog for him. He pats me on the back, and on the shoulder, and on my chest. "I love you, mommy!" he says, and kisses me on one cheek, then goes around and kisses me on the other, and then does it again. "You've got cheese powder all over your shirt," my husband informs me. And on my face too, no doubt. At my first chance I run to the ladies' room and try to scrub the cheese powder off with a wet paper towel. Fortunately, I had worn a black shirt. The dance number went well, even if I was a little cheesy. In Livermore, California you can tell the town is full of engineers. The neighborhood playground is decorated with ABC's, 123's, and circuit diagrams. There's something odd about this circuit diagram, however. The people who planned this geeky playground attraction were obviously not the same people who installed it. Positive goes on top, negative on the bottom, folks. This circuit diagram has been installed upside-down. Hundreds, maybe thousands of children will grow up to find themselves very confused in electronics class. How did anyone ever write science fiction before the internet? If I want to know what crops can be grown in Northern New Mexico, what sheep like to eat, whether the people could make hydrogen peroxide or chlorine bleach with materials they might have on hand, how they would grind their own gunpowder, or the best way to deflect a 2 km asteroid, it is all a few clicks away on the internet! Working on this book is so much fun because it concerns lots of things I am very interested in and already know a lot about. It is easy to fill in the gaps in my knowledge with a cruise around the internet. 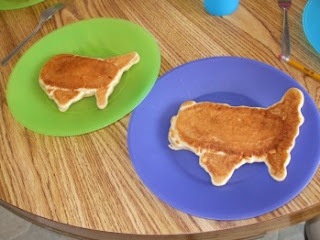 My husband made pancakes shaped like the United States of America for breakfast on the 4th of July. 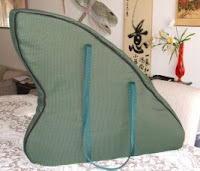 I finished the harp case last night, so that marks the end of another major project! And now, for my next trick, I will draft a 120 page post-apocalyptic science fiction novel for 9-12 year old readers in less than two months. Now that I have a satisfactory plot in mind and some solid character development hammered out, I feel like I could just sit down and write the whole thing. It surprised me to discover that after a certain point in the development process the scenes and dialog simply flowed into my head the way they always do, even though this is a fresh new world with fresh new characters I have never worked with before. I wake up in the morning and have exciting new ideas, just like I did for my other books. On top of that, this time I've had so much fun researching Titan II missile silos, anthrax, and asteroid deflection techniques. Maybe I'll stick to science fiction from now on!